When I sat down to watch a Christmas movie and relax for the night, I felt like something was missing. Grumples was curled up next to me, my tree is up, and the living room couldn’t get any cozier. And then it hit me; I needed a holiday treat to kickstart the season. Listen to this song while you read the post. It’ll put you in the spirit for sure! While I was at BJ’s grocery shopping for the week, I saw the Bolthouse Farms low fat eggnog. I’m pretty much an eggnog expert. I’ve tried almost every brand and if I haven’t tried it, I’ll buy it and try it! I have three different cartons of eggnog in my fridge. I’d really like to try and make my own crockpot eggnog this year. I’ve heard it’s pretty easy, so if you have any recipes, please share! The Bolthouse eggnog tastes very unique, it’s full of spice and has a very thick consistency. I wasn’t too sure if I liked it at first, but it grew on me quick. I was going to just have a cup of eggnog, but chocolate sounded really good too, so I decided to make an eggnog hot cocoa. In a pot on medium-high heat, I stirred up 1/2 cup egg nog, 1 1/2 tablespoons of unsweetened cocoa powder, 1/2 packet stevia, and 1/4 cup of vanilla almond milk. I added light whipped cream on top with a sprinkle of cinnamon. You can add extra cocoa powder if you want it to be more chocolatey. I usually use a light hot coca mix with eggnog, but this was a delicious quick fix when you don’t have any in the house. It hit the spot and put me in the Christmas spirit even more. I added a hazelnut wafer for a little something extra. Tonight, I’m watching Christmas with the Kranks. Do you prefer white lights on the tree or colored lights? All great movies. It’s a Wonderful life is my boyfriends favorite. Hhahaha it really depends on the year, but this year I’m all about it! By far my favorite Christmas movie has to be Rudolph. To put me in the Christmas spirit, I love going to Winter light shows – this year a local one held an event called leashes under the lights where you could take your dog and walk the entire thing. I’m from the DC area and we have a radio station that plays Christmas music 24/7 leading up to the 25th so that also puts you in the spirit. I definitely prefer white lights. They just seem clean and classic to me. I hope you have a wonderful holiday! That sounds like so much fun!! Where are the light shows and are it still going on? I’d love to check those out! I’m sure you can find some in your area too! My most favorite holiday movie is The Christmas Story. It’s a classic. It’s a tradition to at least watch it 5 or 10 times when it’s on 24 hours on TBS!! I perfer colored lighs on a Christmas tree becasue that’s what I grew up with every year. I have a fake tree now and it has white lights.. I like it but it’s not the same. I do love white lights hung outside on the house though. Love that movie! I save it for Christmas day though! We leave it on my T.V. all day long. Yes to all of that! Next weekend we are driving around looking at Christmas lights! I agree:) But I try to mix the both! I just hung colored icicles on my porch. I just posted a pumpkin-eggnog latte on the blog because I am also obsessed with eggnog! Eggnog and hot chocolate sounds even better!!! I am going to have to check that out! Yum! Beautiful Pics! 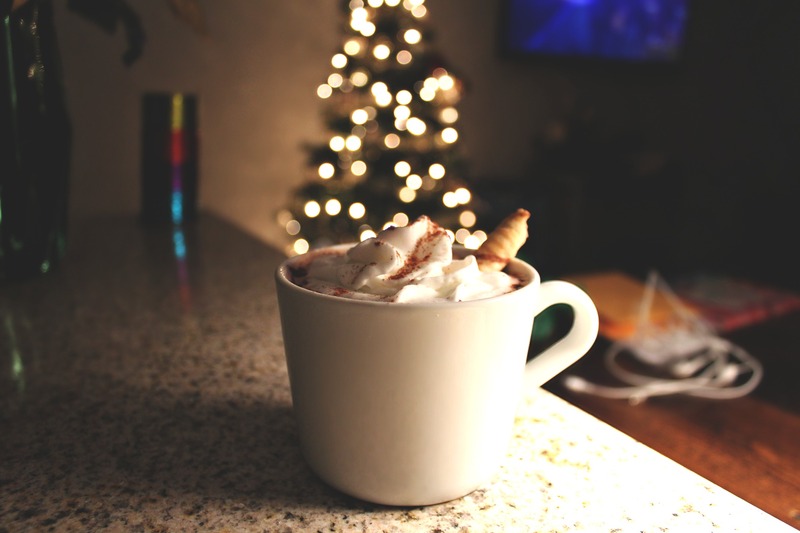 Eggnog with hot chocolate… Yummy! It´s a must! 1. One of our Must-See-Holiday-Movies is: National Lampoon´s Christmas Vacation. 2. Decorating, baking cookies, Music and the decorations in the streets. Our new neighbours are obviously obsessed… I´m afraid, we have to put on some sunglasses, when they go on with their lightshow. bahaha But… I love it. 3. I used to have colored lights while the kids were younger, but I prefer white lights in the last years. And the Christmas balls are color-coordinated. I go with silver and white. Hug the pups and have a nice day! 1. Thank Grinch for the win! 🙂 Love that movie so much. I can quote every line! 2. Hahahaha that is hilarious. You must have some bubbly neighbors! 2. Being with my family and loved ones and cutting down our tree puts me in the Christmas spirit! 3. I always grew up with colored lights, but I’ve been thinking about trying white soon! 1. I love Santa claus as well! 2. That sounds like a lovely time with the family! 3. I grew up with color, but now do white with a couple splashes of color around the place! 1.) Love, love, love Elf and Home Alone. Also enjoy Four Christmases with Reese Witherspoon and Vince Vaughn. 3.) I’ve always been a colored lights person. I think it just keeps reminding me of my childhood… But the trees with white lights and white and silver ornaments are starting to get my attention. Maybe next year! Hahahaha that is how I feel throughout the day! I just want to watch Christmas movies! I was up until 3 am yesterday watching them…whooops. It wasnt too fun getting up this morning but totally worth it! 1. Those are all good movies…BUT I HAVENT SEEN ELF…;) I’ll get on it! 2. haha I love the christmas spirit you have! That is awesome 🙂 & I’ll look into that CD! 3. Colored lights definitely remind me of my childhood too! I like to have both! I have a white tree in my living room and a colored little tree in my bedroom. 3. Depends. On my big tree in my living room, we do white lights. But I have a mini tree I set up on my desk at work and I really like seeing it with colored lights. The Family Stone is seriously the best! Great holiday movie 🙂 AND THE HOLIDAY! with Kate Winslet and Cameron Diaz. I love everything about Christmas music! I have the white tree with lights and the little tree with colored lights too! I was going to watch Christmas with the kranks last night, but it was on too late. I have yet to see it, but I did enjoy the book. my favorite holiday movie is national lampoons Christmas vacation. and the family stone. and love actually. ok, I have a few favorite holiday movies. I don’t know what puts me in the holiday spirit. I sure wish I did. 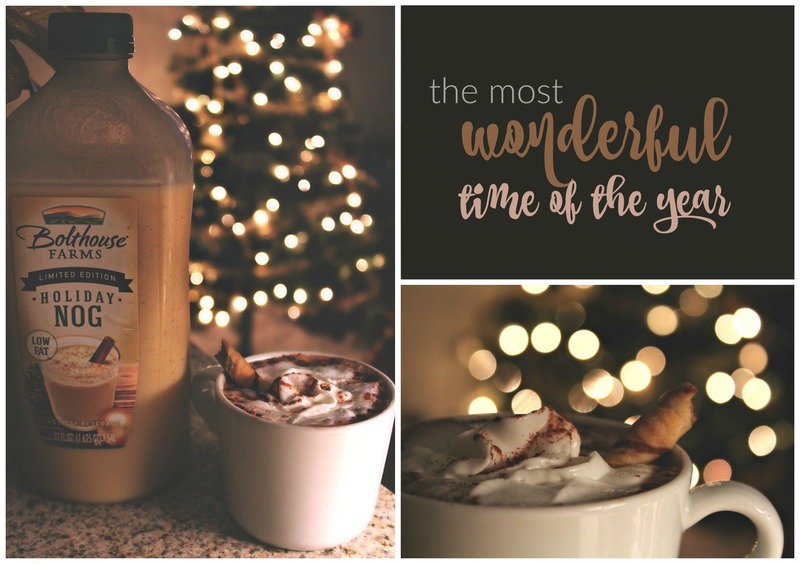 What is the name of the font you used on your photo for “wonderful time of the year”? Love it! Hiya Taralynn! I haven’t always been a fan of eggnog, but I made your french toast last year and that was super yummy! 2. Watching Christmas movies/specials and listening to music get me in the spirit. Also taking my 2 year old to see the lights. Seeing him get so excited makes me love the holidays more! 3. I always go white lights. I think they bring out the color of my ornaments more! Glad you liked it! Eggnog has a really thick consistency that you have to get used to! It’s really good in baking though! 2. I bet having a little one is so much fun at Christmas time! 🙂 It’s so magical to them. 3. I love a white light tree with colored ornaments! 1. My favorite holiday movie is Elf! Although, Home Alone is a very close second. 🙂 You definitely have to watch Elf, though. 2. Cold weather and listening to Christmas movie puts me in the Christmas spirit and makes me want to decorate! 3. This year I’m feeling all white lights, but I tend to go back and forth every year. 1. I know. I’m going to watch it with Nick this weekend! It’s his favorite Christmas movie. 2. It’s been KINDA chilly (off and on ) here and that helps, so I agree about the cold weather. 3. It all depends on the mood you’re in 😉 I get it! LOVED IT!!! Thought it was so good & funny! I don’t even like Will Ferrell and he was AWESOME in that role! This sounds delicious! I never purchase egg nog though cause I’m the only one in my family who likes it :/ Anyways’ I was curious what camera you use? Your pictures and photography style are gorgeous and I’d like to get into photography, but aren’t sure where to start. 2. Our town puts up a Christmas tree in the town square and there’s a bunch of local shops and a Christmas orchestra. 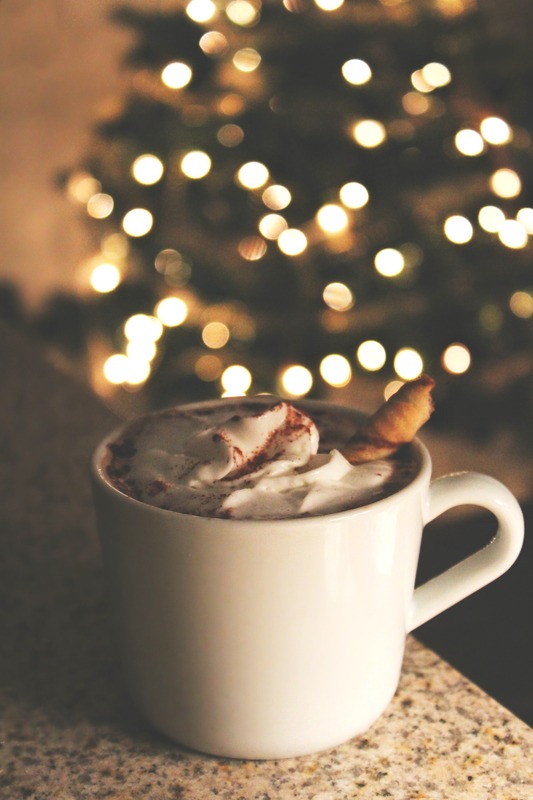 We love to to watch the lighting of the tree and drink red chile hot chocolate (a local favorite)! 3. And I like any kind of lights, as long as they fit with the decor! Thank you so much 🙂 I use a number of cameras! I use my IPHONE 6PLUS, Cannon Rebel T5I, Olypmus Tough! 1. I’m not sure if I’ve seen that…! 2. That sounds magical! 🙂 red chid hot chocolate? that sounds so good! 1. I love The Santa Clause, though it has been a few years since I’ve watched it. That may just need to be a thing this year. 2. Hmm. I would say festive holiday beverages put me in the holiday spirit. I’m not big on gifts, giving or receiving. So, my friends and I usually do “experiences”. We go on a “date” & enjoy some time together instead of spending time shopping for each other. My favorite is when that entails grabbing a festive drink from Starbucks & walking around downtown. Also, that eggnog latte sounds fantastic. I got some Evan Williams eggnog liquor last weekend & adding a splash to an evening cup of decaf coffee is delicious. I think I’m going to watch that one tonight. I wish all these movies were on Netflix! I love the idea of doing “experience”! That is very cool and different. You’re making me want to go get a peppermint mocha! Agree 🙂 Both are great. 2. It’s hard to say what puts me in the Christmas spirit…probably driving around and seeing everyone put their Christmas lights up and seeing trees in windows. Plus I live near Olgebay in Wheeling, WV (work about 10 minutes from it) and they are known for their festival of lights every year, so those help too. 3. I’m impartial. I grew up with colored lights and that tends to be with what I go with for lights on my Christmas tree. By the way, I’ve never tried eggnog before, and I’ve always read your blog posts around Christmas time where you drink and love it. Have any thoughts or suggestions on a brand to try first? Both great movies. Tim Allen is one of my favorites. My mom actually met him when I was a little girl at the Norfolk airport and she got me his autograph. She said he was one of the nicest celebrities she’s ever met. She ran into a lot of them while working at the airport. Wow that sounds so pretty! I’d love to take a road trip up there! YOU HAVE TO TRY IT! A lighter brand SODELICIOUS (it’s dairy free but you can’t tell) Southern comfort is good! (think and sweet) or just go with your grocery stores brand in the jug! I have never tried egg nog but I definetly will now, this looks delicious. 1.My favorite Christmas movie is the Santa Claus. 2. Christmas movies and music always puts me in the Christmas spirit, although this year I am having a harder time getting in the spirit. 3. My tree has colored and white lights, you can set it to either/or or have it set to flash back and forth. The best of both worlds. Love your blog! You are such an inspiration. Do. It. Now. 🙂 So good! xo xo Thanks so much for stopping by and commenting! 3) White lights all the way! That is my boyfriends favorite Christmas movie. They had a live show of it last year. That is one of my favorite things to do! With peppermint hot cocoa! That drink looks absolutely delicious! I might have to make a trip to the store on my way home today. 1. Love Actually. I can’t go a year without watching it. 2. Living in Georgia now, I can’t enjoy the first snowfall anymore, so I make do with turning on some Christmas music (which I embarrassingly admit I started listening to back in October or so) and making hot chocolate. 3. White lights. I’m all for the clean look of a tree. I did colored lights as a kid, but I have much more appreciation for white lights now. 2. I lived in Georgia for a Christmas! There are tons of Christmasy things to do there! I listen to Christmas music in July!! 3. I think most people would agree with that! 1. The movie that actually signals to me that it’s the holidays is Home For The Holidays with Claire Danes, Robert Downey Jr. and Holly Hunter- it’s an oldie and kind of obscure and focuses on Thanksgiving, but I watch it every year. Jodie Foster directed it. 2. Old school Christmas songs like Bing Crosby or Sinatra-type songs. 3.White lights but my hub loves multi lights, so we end up with an amalgam that’s visible from space. Girl, you live in the south, have you tried the amazing concoction that is boiled custard? It’s eggnog’s super southern cousin and is found in the same area of the store as eggnog. It’s absolutely the richest thing ever so you only need like a shot glass worth of it for the entire season, but it’s worth it. YES BING CROSBY FOR THE WIN! I love his pandora channel. That sounds so cool! I love that you guys go all out! It’s an old movie from Disney, produced 1992. You will love it, i’m sure! Whats your favourite song from the polar express soundtrack? I love Seeing is believing. Its magical. When will we see your christmas tree?? Hahaha that is ok! 🙂 You have great English! I love “Believe””becuase we did it for a Christmas concert in high school. It was really magical when we sang it at an old folks home and they all cried. I’ll never forget that moment! I’m also not finished 😉 But i love to do this with music and cookies and slooowly…. 🙂 Make my little breaks with christmas movies…then going around the house….decorating…. This weekend, I’m going to a pop-up bar in DC… basically, a bar called Mockingbird Hill has transformed into a holiday wonderland for the entire month, with tons of decorations and a special cocktail menu. I can’t wait… Its definitely going to solidify the holiday spirit for me! Yes. That is one of my favorite Christmas movies. I love the tacky sweater parties and everything christmasy! I have a Christmas party this weekend that i’m excited for! Um, let me know how that bar is! I may have to make a trip up there soon to see my brother and Karlee! The bar is Mockingbird Hill, but it’s being renamed as “Miracle on 7th Street” for the month of December. if you google “Miracle on 7th Street Washington DC” it should be one of the top 3 links! The cocktail menu looks divine (and I normally don’t drink liquor cocktails). 2. The Soundtrack from Polar Express. Your Christmas tree sounds gorgeous!! I love Christmas too!! omg I’m making this tonight! I’ll have to make it with lactose free egg nog though. What’s your favorite lactose free nog? Listening to Christmas music and having my apartment decorated always gets me in the spirit! I prefer colored lights but I love both! The lactose free eggnog is actually one of the best! Even buzz feed thought so! The Lactaid brand (it’s a green carton). I love Polor Express, but putting ELF on my list! I love both as well 🙂 Both put me in the spirit! I will go for the lactaid brand! haha thanks! First comment after reading your blog from the beginning…Love it! 2. If I’m fortunate a shopping trip in Chicago, if not then shopping around home! 3. White lights inside all the way! But colored or white outside, what ever gets houses lookin beautiful? 1. Great movie! I told someone above…when I was little, I had a crush on Charlie. When they came out with Santa Clause two I was in fifth grade and fell in love once again. 1. That is a good one! 3. I think the white lights are so pretty! 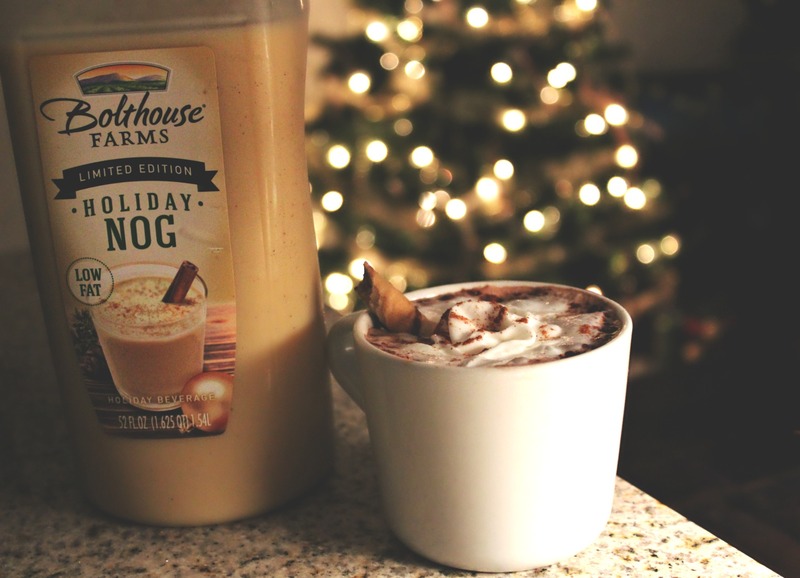 I love that you have a post dedicated solely to eggnog. I secretly LOVE eggnog but am a little ashamed to admit it because I feel it gets a bad rap. 1. I have two favorites….Home Alone & Christmas Vacation. They are both classics and I couldn’t pick one over the other. I watch them both at least 10 times each holiday season. They never get old!! 2. The first snowfall always puts me in the Christmas spirit. I feel that once it snows it’s officially winter and the holiday season. 3. I have a strict white light policy hahah! I am not a fan of colored lights. AT ALL! White lights are so classic and modern. They just fit my personality better I suppose. I simply LOVE eggnog. I also love making recipes with it! It’s definitely a hit or miss with people. I can’t keep enough of it in my fridge during the holidays. Nick and I go through that stuff so quick! It’s my Christmas weakness. 2. Ugh. Wish we had snowfall here during Christmas! Miss that part of Iowa. I went to the University of Iowa so every time you post something about Iowa or the school, it makes me happy! We just had about an inch of snow this morning…if you could see it, its gorgeous. Grumples would sure love to run around in it! Really!?! My brother went there as well 🙂 I grew up loving the Hawkeyes! 12-0!! Ugh. I miss Iowa’s snowfall and Grumples used to LOVE LOVE LOVE to run around in it! It has been huge hit with my family! I enjoy it cold, but my favourite way to drink it is in a homemade eggnog latte!! I use goats milk instead of almond milk and cut back on the sugar and use honey instead. I love your feature image, so festive! I’ve never been an eggnog fan, but this recipe sounds quick and like it may be good. I’ll have to trust you! My favourite Christmas movie is between Elf, and A Year Without A Santa Clause, the songs in that are so catchy. The past few years I haven’t been in the Christmas spirit, but this year everything seems to put me in the spirit. I saw frost on the ground yesterday morning and got so happy I was snapping so many photos of it…but it’s just frost haha. And I like white lights with coloured ornaments! I think eggnog is a hit or miss with people! BUT give it another shot! I don’t think I’ve ever seen A Year Without A Santa Clause……I’ll have to add it to the list! White lights with colored ornaments for the win! I made ADORABLE gingerbread men for my tree a couple years ago and want to do something like that again. You definitely have to add Year Without A Santa Clause to your list! It’s pretty old but a classic. Ooh how did you make the gingerbread men ornaments? Did you use actual gingerbread? Hi! I never comment either but I honestly wake up everyday wondering if you have posted anything. Ypur posts are my favorite and I enjoy following you. My favorite christmas movie is Any of the Santa Claus ones but I also enjoy Elf. Christmas music and all the decorations put me i. The christmas spirt, i honesltly love white lights but the colored ones are making a comeback. And, have you tried the Egg nog Latte from starbucks?! Im on weight watchers so I try and only have 2 before they go away but they are so delicious !!!! Really? That makes me so happy! Thank you! xo thank you for commenting! 1. Favorite Christms movie will always be Home Alone! I watch it every year! 2. Candles, Christmas commercials, the first snow, hot cocoa, and putting out Christmas decorations all out me in the Christmas spirit! 3. I love white lights for the outside of the house but for the Christmas tree I’m all about color! 1. Ahhhh yes! I love the Home Alones! They remind me of my brother 🙂 We used to watch them as kids. 2. Christmas commercials get me excited during the Fall! I wish we had snow here on Christmas. I miss the Iowa snowfalls! 3. I’m the reverse of you lol. But, i actually may do colored lights next year to switch it up! 1) The Polar Express. My family watches it together every year! 2) Baking cookies and blasting Christmas music! 3) White lights all the way- I love the way they sparkle! 1. Great choice. That movie is magical. 2. Yes yes yes! I do this the night before Christmas Eve! Hi Taralynn! 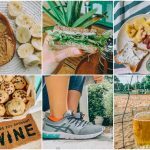 I’ve kept up with your blog for a few years now, and absolutely love it! Keep up the great posts! 3. I used to love colored lights, but I’ve transitioned to white. They just seem to classy. 1. That is such a relaxing movie to watch. It’s just a beautiful movie. 2. All of that while listening to christmas music! 3. Agreed 🙂 I like to incorporate the colored lights somewhere, but my tree is white. I like the colored ornaments! 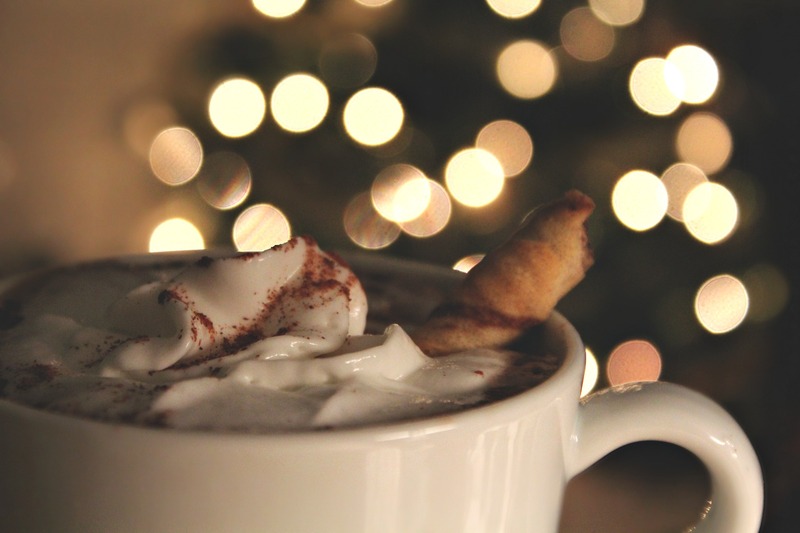 The cover picture on this post is the definition of the holidays/winter… I love it! I’m currently watching How the Grinch Stole Christmas (the real people version 😉 ). It’s one of my favorite Christmas movies! I have only tried eggnog once and was not a fan but I want to give it other try. I made Polar Express hot cocoa the other day for some friends. Totally NOT healthy but SO yummy and I added a little coffee to it for a delicious mocha! 1) Elf. All time fave. My husband and I watched it the other night and I colored in my Christmas coloring book for grown ups. It was pure bliss! 2) EVERYTHING puts me in the Christmas spirit. It is my favorite time of the year and I try to soak in every minute. We are living in our first ever house and I especially have loved getting to decorate it. 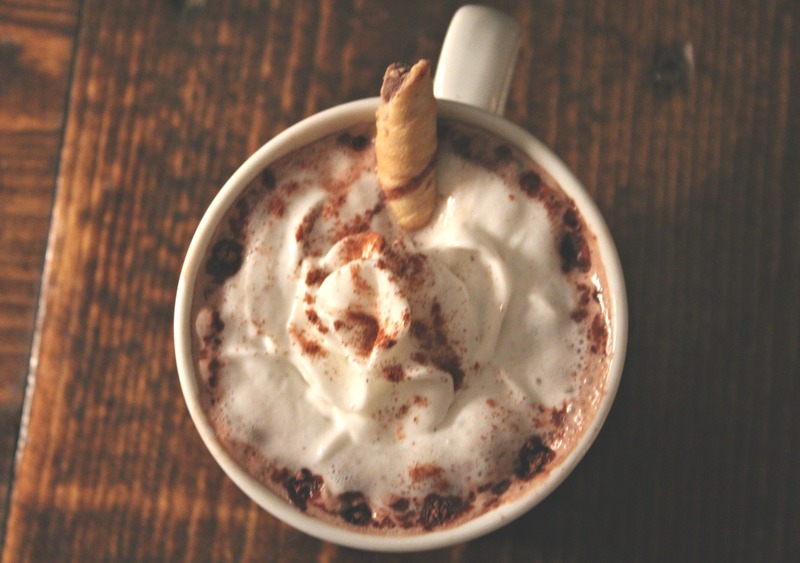 Do you have any good healthy hot cocoa recipes? I love love love it. Maybe try a new brand 🙂 But, it’s also not for everyone! That actually sounds delicious! 2. I bet that was so much fun decorating for Christmas! 🙂 & It’s my favorite time of the year as well. I’m so happy I’m actually in the Christmas spirit this year. I usually use a hot cocoa mix, but I may come up with a healthy recipe! 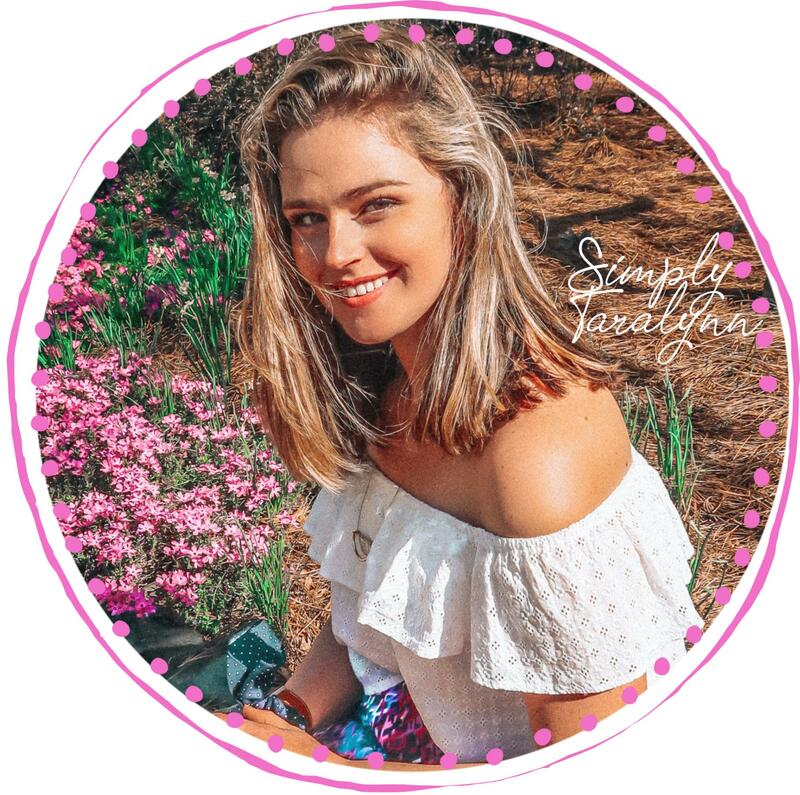 First off I have never commented on here but absolutely love your blog! I’ve been following it about 3 years now and look forward to your posts! 2 years ago I followed your team taralynn and all your awesome tips and lost 40 lbs for my wedding the HEALTHY way! Now I have a 1 year old & still working on getting the baby weight off using the same tips I did the first time around! I love seeing how you interact with all your followers. You seem like such a genuinely sweet person and that’s refreshing! 2. Decorating for Christmas the day after thanksgiving definitely gets me in the holiday spirit! As well as hearing the first Christmas song on the radio & hearing peppermint mochas are back! 3. Love colored lights because they remind me of childhood but I do white on the tree now because it just looks so pretty! My house has red and white on the roof though which I love…a little of both! 1. That’s in my top five! I just love Tim Allen! 3. Same here! 🙂 I love seeing colored lights out on the houses when I’m driving around looking at lights with hot cocoa! I bet your house looks lovely! Enjoy your season as well! xo & keep in touch! Wow, the hot chocolate egg nog sounds fabulous! I’ve never tried that. (I did have some egg nog tonight though). Do you just add a pack of hot cocoa mix to it, or do 1/2 egg nog and half almond milk? I’m intrigued! 3. White lights, at least this year! 2. I love listening to Christmas music while I bake or work! 3. I have the white lights on my tree too! I love love love white lights!!! I just think they are more beautiful and a little romantic. ? Lol ( I had them everywhere at my wedding!) I’ve never tried chocolate eggnog, I’ll have to do that this season. I always love reading your posts, but never comment for some reason! 1 – my favorite holiday movie is Elf! It’s just so funny! 2 – definitely decorating my tree is what puts me in the holiday spirit… we traveled for thanksgiving and have a 4 month old baby so we’re definitely falling behind on the decorating, I’m usually done by now! 3 – I go back and forth between white and colored ligths.. right now I have a tree with white lights and I added red lights to it.. I love it! 1. I’ve never seen Elf……….but will put it on my list! I’ve heard that it’s really good. 2. I just started today for my place, but hopefully can get some more stuff up, so you’re not the only one behind! We have 24 more days left! 3. I’m the same as you! I grew up only doing colored lights, but now I only do white lights, but now I’m thinking about going back! I’m so undecided! Thanks for replying!! Definitely feeling a little “starstruck” after so many years of following your journey! Eggnog is on the grocery list now.. can you recommend a brand?! Can’t wait to hear what you think of Elf! Thanks again! The thought of drinking eggs irks me out. I don’t know if I’ll ever be brave enough to try an eggnog! It tastes nothing like eggs 🙂 & it’s the most delicious thing ever! 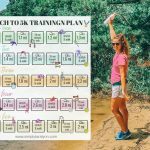 Running, Hiking, & Some Life Changes.